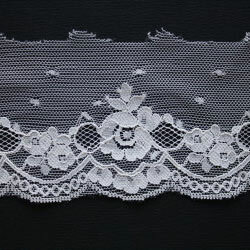 This rigid lace is used for garment accessories, lingerie, bra accessories. Width: 2.64 inch. Repeat: 6.4 cm. Composition: 100% Nylon. Application: garment accessories, lingerie, bra, sock.